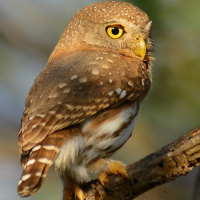 The Colima Pygmy Owl is a tiny owl with a rounded head and no ear-tufts. Typical call (male) - Panuco, Sinaloa, Mexico. November 1999. CC Richard Hoyer. Description: The facial disc is pale ochre with indistinct darker concentric lines. Eyebrows are short and whitish. Eyes are yellow. Cere and bill are yellowish-horn. Upperparts are greyish tawny-brown, with the mantle slightly more greyish than the crown. Forehead to nape are densely spotted whitish or pale buff. The nape has an occipital face (false eyes) with a cinnamon band across the hindneck. Scapulars have indistinct pale buffish spots, and the wing-coverts are slightly spotted pale buff. Flight feathers are barred light and dark, and the tail is greyish-brown with 6-7 buffish-white bars, of which only 3-4 are normally visible, as 2 are concealed by the uppertail-coverts. Underparts are off-white. The sides of the upper breast and streaking on the rest of the underparts are cinnamon-brown. Tarsi are feathered, and the pale yellowish toes are bristled. Claws are horn with darker tips. Size: Length 13-15cm. Wing length 81-88mm. Tail length 51-56mm. Weight 43-48g. Females are larger and heavier than males. Habits: Not well studied. This owl is partly diurnal. 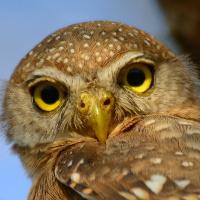 Other habits likely similar to other Pygmy Owls. Voice: The song of the male is a series of hollow, short notes, often increasing in number (up to 24 or more in one phrase), about three notes per second - whew-whew-whew whew-whew-whew-whew-whew whew-whew-whew-whew-whew-whew... The interphrase intervals are relatively long. The series are often preceded by trilling notes. 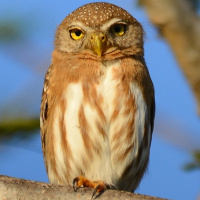 Hunting & Food: The Colima Pygmy Owl feeds on small birds, reptiles and other small vertebrates, as well as larger insects and other invertebrates. Breeding: Little studied, likely nests in abandoned woodpecker holes and lays eggs in May. Habitat: Dry, tropical woodland from sea level up to about 1500m, including thorny woods in foothills, palm groves, semi-deciduous forest up into dry oak woodland. Sometimes inhabits dry pine-oak woods. Occurs locally in ravines at the upper edge of tropical deciduous forest, and has also been recorded in swampy forest. 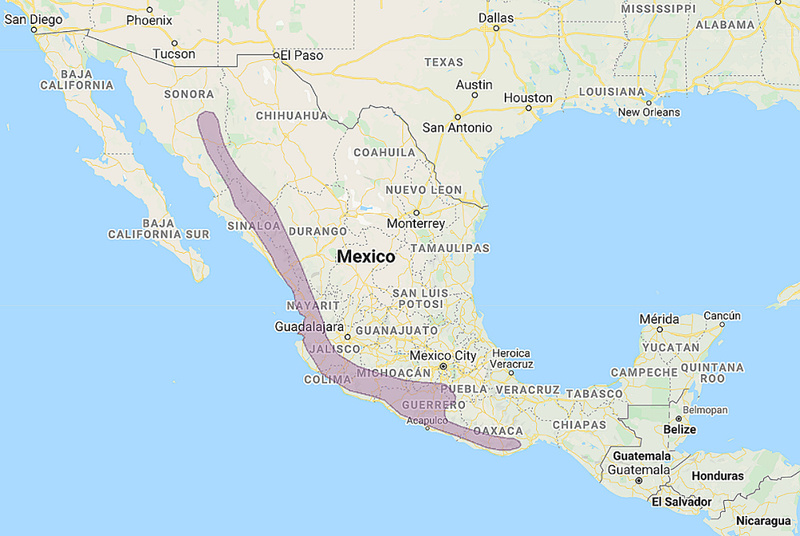 Distribution: West Mexico along the Pacific coast from Central Sonora to the Isthmus of Tehuantepec in Oaxaca. Original Description: Nelson, Edward William. 1901. Auk 18: p. 46. Page by Deane Lewis. Last updated 2015-11-20.